Building on the successful implementation of exhaust gas scrubbers on its self-unloading bulk carrier Hon. James L. Oberstar, the Interlake Steamship Company announces its plans to expand its emission-reduction efforts to one-third of its fleet by installing similar scrubber systems on the Lee A.Tregurtha and James R. Barker early next year. Technologies Corp. (BELCO), a division of DuPont Sustainable Solutions. A total of five Interlake vessels — including two additional 1,000-footers: the Paul R.Tregurtha and Mesabi Miner — will be outfitted with these types of scrubbers by 2017. The scrubber units, which are attached to the exhaust system of each of the ship’s two engines, effectively strip the majority of sulphur from its stack emissions. Here’s how the systems work: exhaust gas from the engine is sent through a series of absorption sprays that ‘wash’ and remove impurities, specifically sulphur and particulate matter. That washed gas then travels through a droplet separator before a clean plume of white steam is discharged into the atmosphere. At the end of the 2015 navigation season, the Tregurtha and Barker will sail to Bay Shipbuilding in Sturgeon Bay,Wis., to have the scrubbers and associated equipment installed during winter layup, in early 2016. Bay Shipbuilding is where the first successful installation on the Oberstar was completed earlier this year. As the operator of first US-flag fleet to implement the scrubber technology, the company was not only tasked with proving its emission-reduction capability but also taking the lead in developing a sustainable supply-and-delivery infrastructure to support its widespread use on the Great Lakes. Specifically, the scrubber system relies on an injection of sodium hydroxide — to neutralize and remove sulphur from the exhaust gas – and that chemical has to be delivered to the vessel about twice a month. Working with partners, Hawkins Inc., PVS Chemicals Inc., Garrow Oil & Propane and OSI Environmental, the company has established waterfront supply capability at Sturgeon Bay,Wis., and Detroit, Mich., and expects to develop a similar capability in Duluth, Minn., hopefully within the next month. From there, the supply-and-delivery infrastructure will be built out at ports located near East Chicago, Ill., and Burns Harbor, Ind. The scrubber expansion announcement comes only weeks after the Company announced its plans to repower its last steamship — the Herbert C. Jackson — in the final phase of a ten-year, $100 million modernization effort. On August 11, 2015, CSL’s Trillium-class self-unloading Laker Baie St. Paul began discharging the first of 269,000 metric tonnes of aggregates in the opening phase of the construction of Montreal’s new Champlain Bridge. Less than 30 days later, the discharge operation was complete. The complex, ten-trip operation necessary for the construction of a laydown in the St. Lawrence River proved a technical challenge that made the most of standard Trillium-class features including dynamic positioning (DP) features and remote- controlled self-unloading systems. The laydown area would eventually serve to position the equipment necessary to build the new Bridge and provide the base for the soaring twin pillars that are central the bridge’s design. Baie St. Paul was required to discharge the aggregates while moored to three temporary barges in a restricted stretch of the St. Lawrence Seaway. Situated on a bend, the discharge location left Baie St. Paul occupying almost half of the busy shipping channel and resulted in regular ship-to-ship interaction including some slight movement of the CSL ship. With traffic passing at seven to eight knots within meters of the ship, the operation relied heavily on the vessel’s state-of-the-art capabilities. Baie St. Paul’s dynamic positioning features integrates the main propulsion system, steering nozzle, and bow and stern thrusters, all of which can be controlled independently or together using a joystick. Rated at 1,000kW at 1,190rpm and 800kW at 1,185rpm respectively, and powered by electric motors equipped with variable frequency drives (VFD), Baie St. Paul’s bow and stern thrusters were kept online along with the 8,750kW main engine as other ships passed, ready for use in the event of excessive movement. The thrusters also had the critical role of keeping the vessel in position next to the barges during mooring and when the lines were being removed prior to departure. “High manoeuvrability is a huge advantage, especially in restricted waters. The advanced position-keeping technology makes Baie St. Paul the safest option for this kind of operation,” noted Allister Paterson, president of Canada Steamship Lines. Operational safety was also enhanced by other standard Trillium Class features such as an ergonomic bridge equipped with NAV1 notation and IBS notation-compliant monitoring and alarm systems. The technology that’s built into Trillium-class ships to control the unloading rate — like the VFD-equipped belts and feeder gates — gives them the flexibility and capability to meet any requirement. While capable of unloading 5,000tph (metric tonnes per hour), the ability to customize the discharge rate as requested by the shore foreman kept the cargo flow to a manageable level for the excavators, bulldozers and trucks. Advanced Trillium-class environmental features also proved invaluable to the operation, including the enclosed, noise- reducing discharge boom and oil-free propulsion train. Both helped ensure that CSL’s operation had minimal risk of impact on the surrounding communities and marine ecosystem. CSL’s nine latest-generation Trillium-class Laker and Panamax self-unloading vessels and gearless bulkers have been operating in the Great Lakes and St. Lawrence Seaway, and along the continental coasts of the Americas, since late 2012. EMS-Tech Inc. first became involved with self-unloaders in 1995. With a rich history of experience and industry knowledge dating back to the mid 1970s, EMS-Tech was able to quickly climb the ladder of success, firmly establishing its name within the industry. EMS-Tech started with smaller, but important, mid-life refurbishing projects for two of Canada’s pre-eminent ship- owners, notably Algoma Central Corporation and Canada Steamship Lines. Thanks to the energetic and innovative teams in Canada, the Netherlands and China, EMS-Tech was able to grow its client list to the who’s who of ship-owners, operators and shipyards around the world. Even with this growth EMS-Tech never lost sight of its beginnings, the importance of being innovative, and the desire to deliver a quality project while working closely with its customers. Since EMS-Tech’s start with marine self-unloaders, the company has delivered no fewer than 75 self-unloading systems, many of them incorporating patented Feeder Gates and high capacity ‘C’ Loop sandwich belt elevators, with discharge rates ranging from 1,000tph (metric tonnes per hour) to 10,000tph. To date, EMS-Tech has over 2,500 Feeder Gates in operation. In addition to serving the gravity self- unloader market, the company’s footprint now extends to include deck-mounted hybrid self-unloaders as well as transshipment platforms. With leading fabrication and equipment partners in China, Europe and North America, EMS-Tech is able to respond to project needs around the world. As a pre- eminent provider and developer of self-unloading technology, EMS-Tech’s research and continuous improvement efforts are driven to create even better and more efficient systems. Following successful delivery of nine self-unloading systems for CSL and Klaveness, four Laker class self-unloaders and five Panamax self-unloaders, EMS-Tech focused its attention on the material handling systems installed on two 94,000dwt transshippers constructed by Yangzijiang Shipyard, in China, for EOL and Oldendorff Carriers. In addition to these two transshippers, a fourth self-unloading barge, the Osprey, was ordered by Oldendorff. This self-propelled barge is currently en- route to Abu Dhabi where it will go into service with three other barges that deliver iron ore to the Emirates Steel plant located there. WHAT’S NEXT FOR EMS-TECH INC.? In addition to its work for CSL, Klaveness, Oldendorff and EOL, EMS-Tech was engaged by Chengxi Shipyard in China to design and supply the unloading system for Manitoulin, a self-unloader being constructed at their shipyard for Lower Lakes Towing, a subsidiary of the Rand Logistics Inc.; this, in addition to a pair of Panamax self-unloaders, being built in Nantong, for Vulica Shipping, a subsidiary of the Vulcan Materials Company. The Manitoulin will be leaving China for her maiden voyage to the Great Lakes in September of this year whilst the two Vulica vessels are scheduled for completion in 2017. More recently EMS-Tech has been awarded a contract to design and supply self- unloading systems to be installed on two river-class (198m long) EQUINOX-class self-unloaders being constructed by the 3Maj Shipyard in Rijeka, Croatia for Algoma Central Corporation. These ships are scheduled to be delivered to Algoma in 2017. The Post Panamax size sister ships Alfred Oldendorff, and the Antonie Oldendorff, the latest additions to the Oldendorff fleet, were successfully delivered to their owners by New Yangzijiang Shipyard in March and April of this year. They are now on station transhipping iron ore for use in steel mills in UAE and other Middle East countries. The new Oldendorff vessels are eco-type 94,000dwt Post- Panamax self-unloading bulk carriers that feature innovative EMS-Tech self-unloading systems. The EMS-Tech self-unloading system is rated for discharge of iron ore at 3,500tph, and features five stationary receiving hoppers with EMS-Tech patented Feeder Gates, a deck mounted conveyor system, and 2 specialized boom conveyors. rate of 2,500tph. The Osprey is currently en-route to her work station off the coast of Abu Dhabi where she will join her sister barges, the Eagle, Falcon and Hawk later this month to transfer increased volumes of iron ore from Capesize vessels to the Emirates Steel plant located there. The Osprey, like her sister barges, is arranged with a gravity discharge system comprising patented EMS-Tech Feeder gates, tunnel conveyor, an in-line ‘S’ Loop sandwich belt elevator and an aft mounted telescoping boom for transfer of material to the shore receiving hopper. The ‘Manitoulin’ is completing her final commissioning checks at Chengxi Shipyard, is departing from China at the end of September 2015. Following the success of similar programmes completed by CSL, Algoma and Klaveness, a new forebody has been affixed to the refurbished aft section of the acquired Danish-flagged vessel Lalandia Swan. 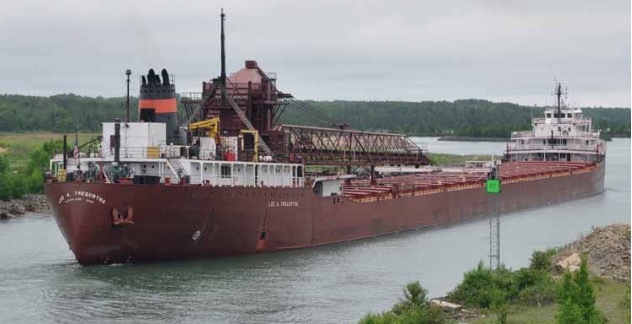 When the Manitoulin arrives in the Great Lakes later this year, she will become the first new Canadian-flagged river class self-unloader introduced into service on the Great Lakes in over 40 years. When it arrives, she will have the largest lift capacity of any existing Canadian-flagged river class self-unloader. The new 25,000dwt vessel is fitted with an EMS- Tech Inc. engineered self-unloading system rated for 5,500tph. The self-unloading equipment is comprised of two tunnel conveyors fitted with EMS-Tech patented Feeder Gates, two transfer conveyors, a 19-metre-lift ‘C’ Loop conveyor, and an 80-metre- long discharge boom. Tech patented feeder gates, a 27-metre lift ‘C’ Loop conveyor, and an 80-metre-long discharge boom. On 26 May this year EMS-Tech signed a contract with 3 MAJ Brodogradiliste d.d. of Rijeka, Croatia, a subsidiary of the Uljanik d.d. Group, for the design and supply of two high-capacity gravity self-unloading systems. Vessel owner, Algoma Central Corporation, is expanding its existing fleet and expects to take delivery of its EQUINOX 650 newbuild vessels in 2017. The self- unloading system will be designed to discharge aggregate and salt at a rate of 5,450tph and will be comprised of two tunnel conveyors fitted with EMS-Tech patented Feeder Gates, two transfer conveyors, a 21-metre-lift ‘C’ Loop conveyor, and an 80- metre-long discharge boom. This work for Algoma follows upwards of ten-gate conversion projects for this company as well as more recent delivery of the systems for its vessels Radcliffe R. Latimer and Algoma Mariner.